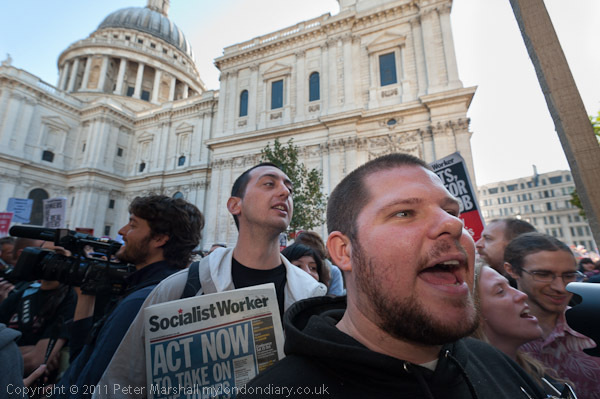 Occupy protesters shout at police who stop them getting to the Stock Exchange – Oct 2011. I wanted to photograph the first anniversary of the unsuccessful attempt by Occupy London to go to the Stock Exchange which led to their camping outside St Paul’s Cathedral both because of an interest in the Occupy movement (see Occupy London Kept Out Of Stock Exchange), but also because I had been there last year, as well as seven and a half months later when they finally achieved – if only for a couple of hours – their objective. 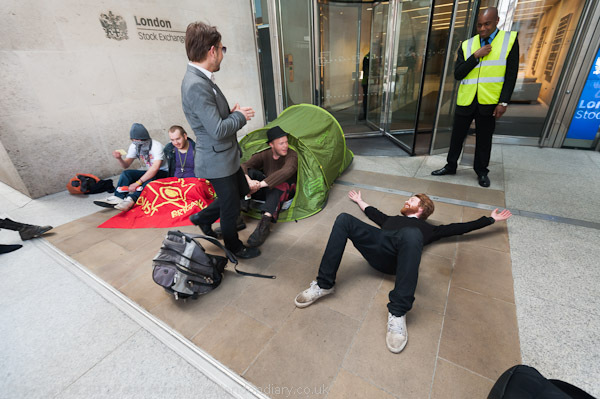 Occupy London, and you can now see more pictures from the day on My London Diary in Occupy Global Noise Street Party. 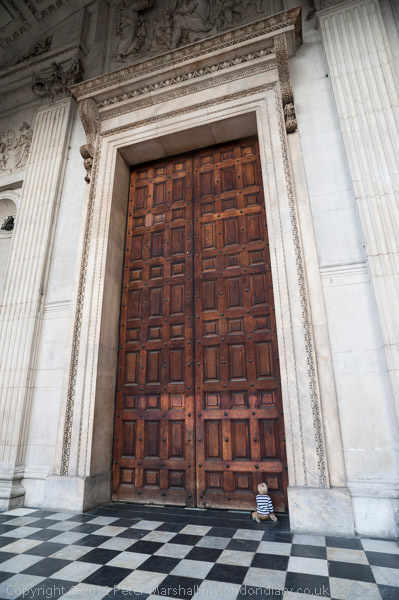 One of the pictures I took early on that day, taken with the 20mm, was of a small boy kneeling in front of the very tall Cathedral door. second version of the image. 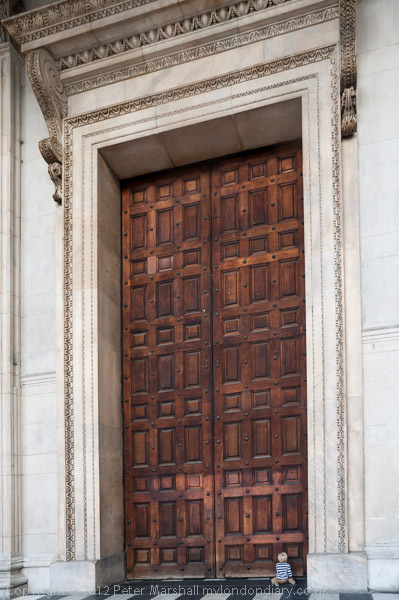 I actually prefer the original, which to me gives a greater sense of the looking up that you have to do when you are standing there under the portico, although the lower version gives me a greater impression of the huge scale of the door compared to the child. The ‘corrections’ also means that most of the tiles on the floor have to be cropped, which I think is also a great loss, giving a picture of a flat vertical surface rather than the three-dimensional quality of the original. And simply graphically the expanse of tiles is more interesting, whereas the narrow strip left of the lower image simply distracts. Somehow too, the lines and diagonals seem to direct my eye towards the child, an effect that is lost when they are reduced to the narrow band. I don’t think there is anything wrong with correcting verticals, and it is something we all learnt to do in the darkroom days, though digital makes it considerably easier and more powerful. [You can also use horizontal correction and make the doorway rectangular, but this simply would look unnatural as you see the inside of the door frame at left, but not at right, so the image is clearly taken from that side.] We are seldom aware of the vertical convergence when we view a seen, and in some respects correcting it better fits out visual experience – as too does the kind of correct I often make from fisheye to cylindrical perspective. Sometimes it works, and other times, as I think in this case, the image is better left more or less untouched. This entry was posted on Thursday, November 8th, 2012 at 09:05 pm and is filed under My Own Work, Photo Issues. You can follow any responses to this entry through the RSS 2.0 feed. You can leave a response, or trackback from your own site.